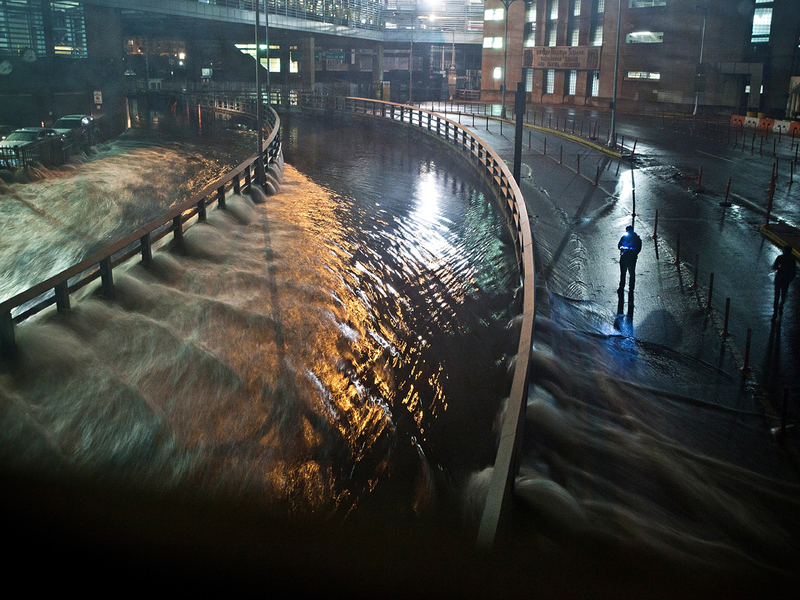 NEW YORK Superstorm Sandy slammed into the New Jersey coastline with 80 mph winds Monday night and hurled an unprecedented 13-foot surge of seawater at New York City, flooding its tunnels, subway stations and the electrical system that powers Wall Street. At least 16 U.S. deaths were blamed on the storm, which brought the presidential campaign to a halt a week before Election Day. For New York City at least, Sandy was not the dayslong onslaught many had feared, and the wind and rain that sent water sloshing into Manhattan from three sides began dying down within hours. Still, the power was out for hundreds of thousands of New Yorkers and more than 7.4 million homes and businesses altogether across the East. The full extent of the storm's damage across the region was unclear, and unlikely to be known until daybreak. Stock trading will be closed in the U.S. for a second day Tuesday  the first time the New York Stock Exchange will be closed for two consecutive days due to weather since 1888, when a blizzard struck the city. Heavy rain and further flooding remain major threats for the next couple of days as the storm makes its way into Pennsylvania and up into New York State. The center of the storm was just outside Philadelphia near midnight, and its winds were down to 75 mph, just barely hurricane strength. "It was nerve-racking for a while, before the storm hit. Everything was rattling," said Don Schweikert, who owns a bed-and-breakfast in Cape May, N.J., near where Sandy roared ashore. "I don't see anything wrong, but I won't see everything until morning." As the storm closed in, it converged with a cold-weather system that turned it into a superstorm, a monstrous hybrid consisting not only of rain and high wind but snow in West Virginia and other mountainous areas inland. It smacked the boarded-up big cities of the Northeast corridor  Washington, Baltimore, Philadelphia, New York and Boston  with stinging rain and gusts of more than 85 mph. Just before Sandy reached land, forecasters stripped it of hurricane status, but the distinction was purely technical, based on its shape and internal temperature. It still packed hurricane-force wind, and forecasters were careful to say it was still dangerous to the tens of millions in its path. Sandy made landfall at 8 p.m. near Atlantic City, which was already mostly under water and saw an old, 50-foot piece of its world-famous Boardwalk washed away earlier in the day. Authorities reported a record surge 13 feet high at the Battery at the southern tip of Manhattan, from the storm and high tide combined. In an attempt to lessen damage from saltwater to the subway system and the electrical network beneath the city's financial district, New York City's main utility cut power to about 6,500 customers in lower Manhattan. But a far wider swath of the city was hit with blackouts caused by flooding and transformer explosions. More than 612,000 customers were without power early Tuesday in the city and suburban Westchester County. "This will be one for the record books," said John Miksad, senior vice president for electric operations at ConEdison. "This will be the largest storm-related outage in our history." New York's transit agency said water surged into two major commuter tunnels, the Queens Midtown and the Brooklyn-Battery, and it cut power to some subway tunnels in lower Manhattan after water flowed into the stations and onto the tracks. The subway system was shut down Sunday night, and the stock markets never opened Monday and are likely to be closed Tuesday as well. Schools were closed and Broadway theaters were dark. "We knew that this was going to be a very dangerous storm, and the storm has met our expectations," Mayor Michael Bloomberg said. "This is a once-in-a-long-time storm." More than 200 patients  including 20 infants from neonatal intensive care  were moved from New York University's Tisch Hospital after its power went out and a backup generator failed. The patients, some on respirators operating on battery power, were taken to other hospitals. A construction crane atop a luxury high-rise collapsed in the high winds and dangled precariously 74 floors above the street. Forecasters said the wind at the top the building may have been close to 95 mph. The facade of a four-story building in Manhattan's Chelsea neighborhood crumbled and collapsed, leaving the lights, couches, cabinets and desks inside visible from the street. No one was hurt. As the storm approached the Northeast over the weekend, airlines canceled more than 12,000 flights in the region. Storm damage was projected at $10 billion to $20 billion, meaning it could prove to be one of the costliest natural disasters in U.S. history. Sixteen deaths were reported in New Jersey, New York, Maryland, North Carolina, West Virginia, Pennsylvania and Connecticut. Some of the victims were killed by falling trees. At least one death was blamed on the storm in Canada. President Obama and Republican challenger Mitt Romney canceled their campaign appearances at the very height of the race, with just over a week to go before Election Day. The president pledged the government's help and made a direct plea from the White House to those in the storm's path. "When they tell you to evacuate, you need to evacuate," he said. "Don't delay, don't pause, don't question the instructions that are being given, because this is a powerful storm." Sandy, which killed 69 people in the Caribbean before making its way up the Atlantic, began to hook left at midday toward the New Jersey coast. New Jersey Gov. Chris Christie said people were stranded in Atlantic City, which sits on a barrier island. He accused the mayor of allowing them to stay there. With the hurricane roaring through, Christie warned it was no longer safe for rescuers, and advised people who didn't evacuate the coast to "hunker down" until morning. While the hurricane's 90 mph winds registered as only a Category 1 on a scale of five, it packed "astoundingly low" barometric pressure, giving it terrific energy to push water inland, said Kerry Emanuel, a professor of meteorology at MIT. And the New York metropolitan area apparently got the worst of it, because it was on the dangerous northeastern wall of the storm. "We are looking at the highest storm surges ever recorded" in the Northeast, said Jeff Masters, meteorology director for Weather Underground, a private forecasting service. "The energy of the storm surge is off the charts, basically." Hours before landfall, there was graphic evidence of the storm's power. Off North Carolina, a replica of the 18th-century sailing ship HMS Bounty that was built for the 1962 Marlon Brando movie "Mutiny on the Bounty" went down in the storm, and 14 crew members were rescued by helicopter from rubber lifeboats bobbing in 18-foot seas. Another crew member was found hours afterward but was later pronounced dead at a hospital. The captain was missing. At Cape May, water sloshed over the seawall, and it punched through dunes in other seaside communities. "When I think about how much water is already in the streets, and how much more is going to come with high tide tonight, this is going to be devastating," said Bob McDevitt, president of the main Atlantic City casino workers union. "I think this is going to be a really bad situation tonight." In Maryland, at least 100 feet of a fishing pier at the beach resort of Ocean City was destroyed. CBS News correspondent Chip Reid reported from Ocean City that sea levels could rise 8 feet above normal - enough to flood much of the city. Reid reported that some, like surfer Brian Dean, said they have decided to stay. "We've got everything pretty well situated, bunkered down, generators, [we'll] hang out, ride it out. We rode out Irene last year, it wasn't that bad," he said. At least half a million people along the East Coast had been ordered to evacuate, including 375,000 from low-lying parts of New York City. Sheila Gladden left her home in Philadelphia's flood-prone Eastwick neighborhood, which took on 5 1/2 feet of water during Hurricane Floyd in 1999, and headed for a hotel. "I'm not going through this again," she said. Those who stayed behind had few ways to get out. Not only was the New York subway shut down, but the Holland Tunnel connecting New York to New Jersey was closed, as was a tunnel between Brooklyn and Manhattan. The Brooklyn Bridge, the George Washington Bridge, the Verrazano-Narrows Bridge and several other spans were closed because of high winds.